Ahh it’s Saturday morning and Shawn and I are heading out for our weekend brunch. Our usually is closed so off we go to Dr. Generosity. I’d been there before but it’s been a few years. From what I remembered it was good, and this time I wasn’t disappointed with my eating experience either. When we arrived, there was a line up out the door, not unusual for a Saturday morning in Toronto…we thought twice about waiting, as we were both starving, but were pleasantly surprised to find out the line was just people waiting for the restaurant to open. So first thing to note here is Dr. 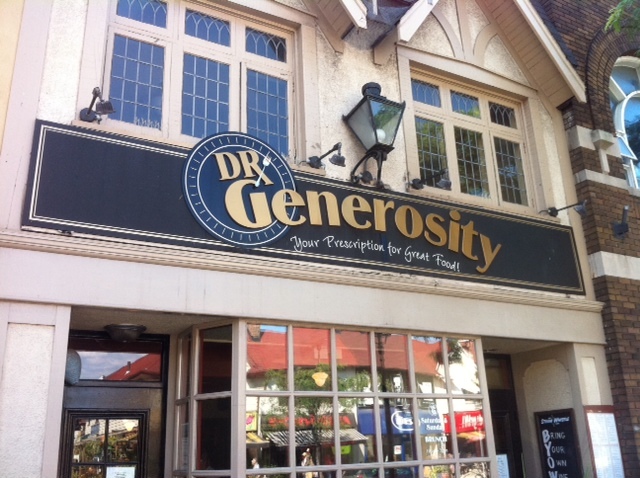 Generosity opens at 10am on Saturdays. 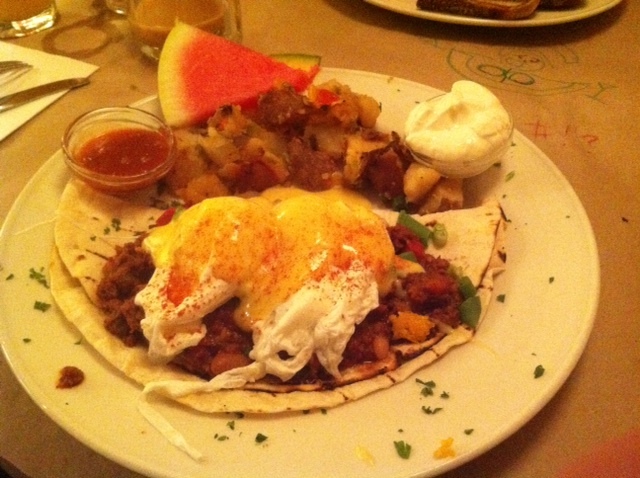 Now to the food: I ordered the boring bacon and eggs, I say that not because they weren’t great but I had serious food envy with Shawn’s Dr. G’s “Huevos Rancheros”. Not only did it look amazing, it tasted even better. I did not taste the salsa after watching sweat beads run down Shawn’s head …it was just as tasty without the salsa, but if you like super spicy, this is your dish! We each ordered coffee and fresh orange juice and I have to say, their name speaks volumes about their portion sizes…they really are generous. The fresh squeezed orange juice was at least 12oz! None of this small juice glass business here. Service was great, coffee was refilled quickly (which is a MUST at 10am on a Saturday), food was great looking and tasting, portions were large and hot! All in all for two coffees, juice and our meal the bill was under $35 with tip. I would go back for sure and recommend it if you have $30 bucks to drop on brunch.